This cereal consists of galaxy-shaped whole grain pieces that look like miniature cinnamon rolls and marshmallow pieces in the shapes of Planet Vulcan, Planet Earth and Delta Shields (the triangular insignia on Star Trek uniforms). 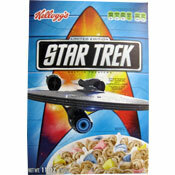 I want to say that Kellogg's Star Trek Cereal tastes like Lucky Charms on warp drive. But I can't. While this is a pretty decent cereal, there's nothing about it that's exciting enough for Star Trek adjectives. It doesn't hit your taste buds like a photon torpedo. If you're not a big Star Trek or unusual cereals fan, there's no need for you to rush to your nearest transporter to beam down to the grocery store. This cereal simply tastes like Lucky Charms with larger non-marshmallow pieces. The whole grain pieces retain a respectable crunch in milk. While they taste fairly plain on their own, they make a nice counterpoint to the sweeter, softer marshmallow pieces. For a novelty cereal, this is the best of the recent trifecta that Kellogg's has given us. It's quite a bit better High School Musical Cereal and a little better than the fruity Hannah Montana Cereal. Will Star Trek Cereal live long and prosper? I've haven't heard of any plans for this cereal to last beyond than the theatrical release of the film. But Dammit Jim, this cereal would have better chance than most cereals based on a movie. Nutritional Considerations: Each 3/4 cup serving has 120 calories, 1 gram of total fat, 0 grams saturated fat, 0 grams trans fat, 26 grams total carbs, 2 grams dietary fiber, 12 grams sugars and 3 grams protein. The first two ingredients on the side panel are whole oat flour and sugar. What do you think of Star Trek Cereal? Nice. 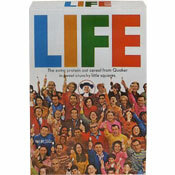 I likened it to cheerios with sweet, crunchy marshmallows. Definitely nothing special, but from a business point of view, it doesn't need to be. It's just an advertisement for the movie. Yea, its good. It's just lucky charms with swirls. I saw the box and i was really hoping that it would be like mini-swirls cereal with marshmallow but no. So its good but nothing special. cool box though.